LOUGH ESKE CASTLE, DONEGAL, IRELAND - On the table today is a question of character. Is former Fed chief Ben Bernanke witless... or ruthless? The tenth autumn of his debt-soaked world has come upon us. 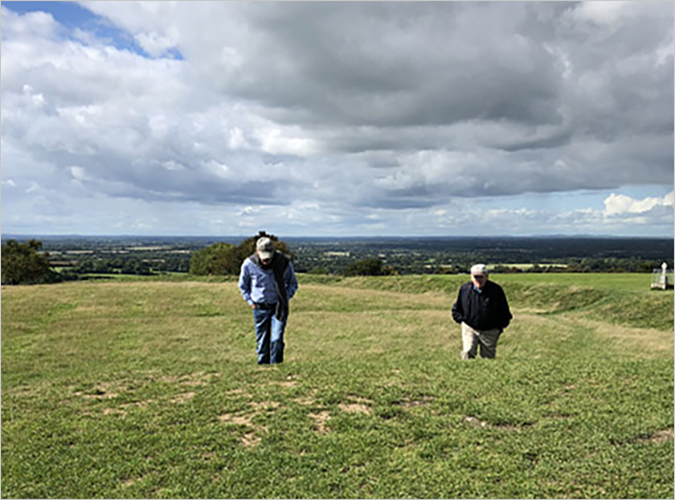 Yesterday, we drove from Dublin to Donegal, stopping to climb the Hill of Tara, where Ireland's ancient peoples buried their dead, honored their kings, and did whatever strange and wondrous things people got up to back then. 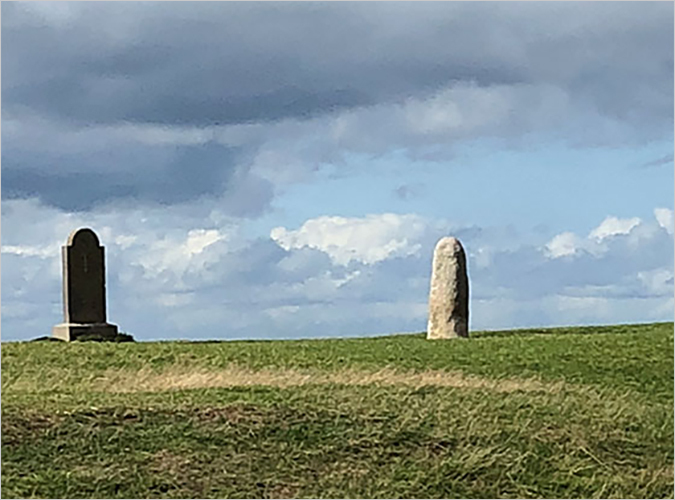 A note from Bill: Monuments on the Hill of Tara. One is presumed to be a phallic symbol. Ireland has been inhabited for about as long as the Americas. Bones found in a cave showed that the first hunters ate bear and deer here as early as 10,400 BC. Before that, the island was covered with ice, and therefore, uninhabitable. Who the first residents were, we don't know. The Celts came fairly recently, around 1,000 BC. Then came the invasions of the Vikings, the Normans, and the English, in that order. Along our path yesterday was the River Boyne - site of the battle that left English Protestants in control of the island. But the Battle of the Boyne might never have happened. Instead, the English, Dutch, Danish, and French Huguenot forces under William of Orange might have merely crossed the river and slaughtered some of the local Catholic farmers. Also along our route was the southwest corner of Ulster, Northern Ireland. There were no border checks. We only knew we were in another country because we noticed that the car license plates had changed in Enniskillen. This relaxed border may be a problem. The UK has decided to leave the European Union. The Republic of Ireland remains a part of the EU. Meanwhile, Northern Ireland remains a part of the UK. And that means they cannot have an open border between North and South. But the Irish have gotten used to an invisible frontier. It gives the island a sense of unity and peace. Putting hard border checks in place - passports, goods, services - will be awkward. Meanwhile, this week marks the tenth anniversary of the collapse of Lehman Brothers. The papers are full of remembrances and lies. Ben Bernanke, for example, is still hailed as a hero. We wonder... Is it a mistake... or a fraud? Former Federal Reserve Chairman Ben Bernanke acknowledged that policymakers made two critical errors fighting the financial crisis a decade ago: They failed to see it coming with such force, then underestimated how much economic damage it would cause later. "Nobody saw how widespread and devastating the crisis itself would be," he said in a short video discussing the results of a 90-page paper on the subject released on Thursday. We - along with dozens of others - thought a crisis was inevitable. The Dow-to-Gold ratio was over 20. Debt had reached 325% of GDP. Houses were selling for crazy prices... with mortgages available even to welfare recipients and household pets. We warned that surely some rough beast was slouching toward Wall Street. Then, using a technical term rarely employed by our fellow financial Cassandras, we predicted that the reckoning would be a "doozy." But Bernanke told the world that the mortgage debt problem (too much debt in the housing sector) was "contained." A few weeks later, Lehman went bust and stocks were roughly cut in half. Later, more than 8 million people lost their jobs, and 5 million lost their homes. Bernanke also says he failed to adequately explain why he, New York Fed president Timothy Geithner, and Treasury Secretary Hank Paulson were using billions' worth of public money to bail out AIG, Goldman Sachs, and other rich Wall Street players. Of course, he couldn't explain it. To do so would be to admit that the whole thing was a scam. The big money flowed to the big players. And when those same big players got too greedy and made too many big mistakes, they were bailed out with the little players' money. Who would want to explain that? But Bernanke's real "mistakes" were much more serious than economic ignorance and public relations mendacity. The obvious one was Mistake #3: cutting rates in a panic. He should have let the correction do its work. If he had, the economy would have eliminated the bad debts, bad businesses, and bad investors (such as AIG and Goldman) that had been caused by the financial flimflam of the preceding 20 years. Today, most likely, we would be in much better shape - with less debt, lower equity prices, and a more stable economy. But he couldn't do that. Because the big mistakes were made by the same people who still controlled Washington and Wall Street... and him. There was no way they were going to sit back and watch their ill-gotten wealth disappear. Instead, Bernanke committed the biggest financial crime of the 21st century (thus far) by sending Congress and the whole country into a fit of hysteria with his claim that "If we don't do this tomorrow [Friday], we might not have an economy on Monday." By "this," Bernanke meant spending $700 billion on a boondoggle program and coming to the rescue of Wall Street with billions of dollars the feds didn't have. Bernanke is either a fool or a knave... a naive Deep State stooge or a scoundrel. Did he know what was really going on and intentionally collude to rob the public in order to protect the cronies, the feds, and the elite? Probably not; we give him the benefit of the doubt. Most likely, he never understood how economies and markets work. And why should he? He was an academic economist in a lame school... a minor actor in a bad genre, like a second-rate star in professional wrestling. Either way, instead of allowing the correction to drain the fetid swamp of its foolish malinvestments, speculations, and financial grotesqueries, he pumped in more liquidity - $3.6 trillion from the Fed. All around the world, other central banks joined in, trying to keep up. Together, they flushed some $12 trillion into the financial markets... which has sent world debt up to a record $250 trillion... and set up another huge debt disaster, coming up soon. How and when will the next crisis arrive? We don't know. But it will be the major financial story of the next 10 years. We request your view! Post a comment on "The Greatest Financial Crime of the 21st Century". Thank you for posting your view!